Locating and being able to shut off utilities that are damaged in the event of an earthquake is important for the safety of your family. This week I’ll show you how to shut off your gas. 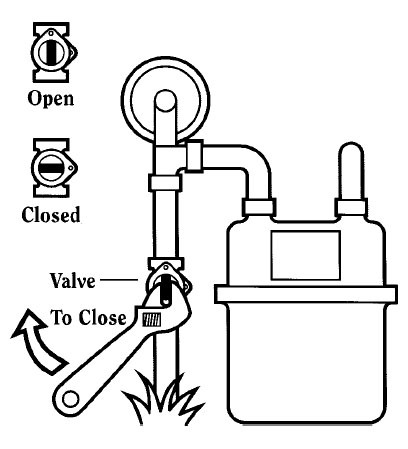 Gas Meter – only shut off if you smell leaking natural gas … Natural gas leaks and explosions are responsible for a significant number of fires following disasters. It is vital that all household members know how to shut off natural gas. If it is not clear to you how to shut off your gas at the meter, it is important to contact PG&E for guidance. Share the information with everyone in your household. Be sure not to actually turn off the gas when practicing the proper gas shut-off procedure. If you smell gas or hear a blowing or hissing noise, open a window and get everyone out quickly. 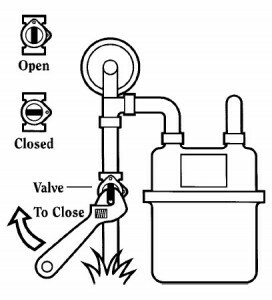 Turn off the gas, using the outside main valve if you can, and call PG&E from a neighbor’s home. CAUTION – If you turn off the gas for any reason, a qualified professional must turn it back on. NEVER attempt to turn the gas back on yourself.